When Dunn’s Marsh resident Jo Kelley saw the City of Madison’s resolution about the Verona Road project, she was very much taken aback. She fired off an e-mail to neighbors and other people who had been active on the subject. She also wrote to Brian Solomon, the City of Madison Alder who represents our neighborhood. Solomon was a co-sponsor of the resolution along with Mayor Dave Cieslewicz. Her e-mail was not in vain. Others who saw the resolution and her comments also wrote to Alder Solomon. The neighborhood’s experience of the DOT process is very different from the praise the resolution currently bestows upon it. Meeting after meeting we did not get answers to our questions. At times the staff made ridiculing remarks about our concerns or about individual neighbors that made specific comments. People that testified at the official SDEIS public hearing in October left the experience feeling disrespected. The resolution doesn't include information regarding the comments in the letters to the Mayor. I think the comments section, to a certain degree, addresses the last bullet. But the others are things I've been hearing for months and I do think we should get them in either the resolution or comments. I know the timing is tight. How do we best proceed, knowing that folks would really like another chance to comment on our comments? Now the DM Neighborhood Council will be discussing DMNA response to the resolution. Read the next article for some details. The meeting starts at 7 p.m., Tuesday, November 16. The location of the meeting is Prairie UU Society on the corner of Whenona and Crawford Drive. Any resident may attend although only Council members may vote. A subcommittee of two Neighborhood Council members plus a former Council member pored over the Madison and Fitchburg resolutions and the City of Madison staff comments for 3 ½ hours on Sunday. They came up with 2 major recommendations for Alder Solomon. The first suggestion is to shorten the resolution to make it simply a submission of city comments rather than a document of praise for WisDOT. The second suggestion is to insert DMNA comments after each set of comments from the city of Madison staff. The three subcommittee members are Donna Sarafin, Kim Zinski, and Mary Mullen. Read the next two articles for further information. And check out the first two attachments for the City of Madison resolution and staff comments. Neighborhood activists were not pleased with the wording of Madison’s resolution submitting comments to WisDOT about the Verona Road project. To see the current wording written by staff of the City of Madison and co-sponsored by Mayor Dave and Alder Brian Solomon, check out attachment 1. It is full of praise for WisDOT. A much shorter version with more neutral language is being recommended by a DMNA subcommittee to the DM Neighborhood Council this Tuesday night. It uses language from the Fitchburg resolution which was seen as more fitting and includes dates of the environmental impact statements. NOW THERFORE BE IT RESOLVED that the Madison Common Council hereby endorses the submittal of comments on the SDEIS (please see the attached document entitled “WisDOT Projet I.D. 1206-07-03 SPES-F NH 04 U.S. Highway 18/151 Verona Road/Beltline, City of Madison Comments” for more detailed project comments, submitted by City agency staff). The City of Madison specifically requests that WisDOT integrate these comments into the Supplemental Final Environmental Impact Statement, commit to the implementation of the specific recommendations (to be finalized during the final design process) and where noted, enter into formal agreements with the City to ensure adequate implementation. Detailed comments on the staff comments will also be discussed at Tueday’s DM Council meeting. City of Madison staff comments on the Verona Road Supplemental Draft Impact Statement turned out to be a mixture of triumphs and disappointments for the DMNA and ADMNA. The two associations had written a joint letter and statement to Mayor Dave prior to his meeting with 10th District Alder Brian Solomon on October 12. · Reconfiguring the Verona Road frontage road so that it doesn’t put Walgreen’s and the strip mall on an island. · Doing a baseline study of water quality and water levels on Dunn’s Marsh prior to any construction and continuing to monitor during and after construction. Have a few choice words you want to tell the Wisconsin Department of Transportation about how you feel about their plans to reconstruct Verona Road and the Beltline and how the construction will affect you? Get your 2 cents-worth in before Friday, December 17. It wouldn’t hurt to copy your remarks to political representatives and DOT staff and their consultants at Strand Associates. Here are some e-mail addresses you could use. The Supplemental Draft Environmental Impact Statement on the project can be studied right in our own neighborhood at Fauozi’s Restaurant on the Frontage Road at 4245 West Beltline Highway. Just ask for it at the counter. Or find it at any of the nearby public library branches, at the main library downtown. How much do you really know about Wisconsin’s tough new OWI (Operating While Intoxicated) laws? 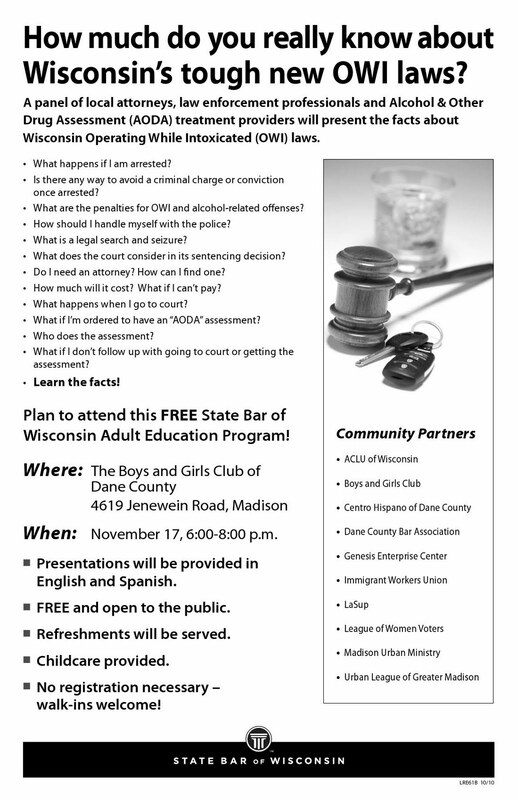 Find out by attending an educational program on Wednesday, November 17, 6-8 pm at the Boys and Girls Club. This presentation is free and open to the public. No registration is necessary. Refreshments will be served and childcare is provided. Presentations will be given in both English and Spanish. 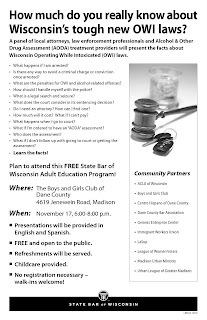 A panel of local attorneys, law enforcement, and Alcohol & Other Drug Assessment (AODA) treatment providers will present the facts about the OWI laws. Check out the questions that will be addressed and the lengthy list of community partners who are sponsoring this workshop by clicking on the attachment. If you are a person with zeal for peace, justice, human rights, environmental stewardship, and the democratic process who likes to sing – or just listen to music -the Social Justice Singalong might be taylor-made for you. Two local musicians will be hosting the event at Prairie UU Society, 2010 Whenona Drive, 7:30 pm, Saturday, November 20. It’s free. Participants are invited to bring “folk instruments” (guitar, accordian, harmonica, drums, etc.) to play along. Both adults and kids are welcome. The musicians are Dan Proud who plays guitar and harmonica and Doleta Chapru who plays many instruments including accordian. This event is sure to lift your spirits. Budget: October and November is budget time on the county board. Below are some of the possible highlights of the budget. The final budget has not been approved yet, so everything below is still subject to (great) change. n Mental Health I: There is funding for two new, 24-hour, treatment centers to provide in-patient services for those in mental health crisis. These centers will serve as alternatives to otherwise bringing people to the county jail or the state’s Mendota Mental Health Institute, where treatment is more secure (regardless of whether such security is needed) and more expensive. This is a big improvement for those needing immediate mental health treatment. n Mental Health II: The county executive’s budget calls for cuts to the jail’s mental health services, responding in part to the decreased incarcerations rate and in part to the above-mentioned mental health centers. However, as the above centers are not due to open until mid-2011, I am co-sponsoring an amendment to maintain mental health intake workers for the time being. It is estimated that 50% of jail inmates have mental health needs; these services are just too essential to lose. n Med Drop: Dane County and Madison have jointly added $40,000 to the budget to establish permanent med drop sites throughout the county. I am excited to have worked on this issue, both to secure funding and to coordinate finding permanent locations. n Human Services: Almost all of the programs were maintained at 2010 budget levels. Although the 2010 budget funding was not ideal, it is a relief that we are no longer cutting these vital services for the most vulnerable in our county. n Merging of Emergency Management Department and 911 Center: This is a new idea proposed by County Executive Falk. It has successfully been done in several communities, and the current Dane County directors of the 911 Center and Emergency Management Department both think it is an idea worth exploring. The executive’s budget called for implementing the merge in 2011, but I am co-sponsoring an amendment to study the idea in 2011 and then, based on the study, implement the merger in 2012. There is some overlap in the two departments, but there are also some unique differences, and I want to study and understand the implications of a merger before approving it. n Sheriff Staffing: The county executive’s budget proposes cutting 8 sheriff deputy’s positions. At this time, I am still contemplating which position cuts, if any, I support. Some of the positions are underutilized (9 rural community deputies); some are no longer needed due to efficiencies (1 courthouse bailiff; 1 process server). n Reserves: There are not enough “rainy day” reserve funds. It is impacting our credit rating (which was just lowered last year), as well as our ability to borrow money for infrastructure projects, and, of course, our financial cushion in times of crisis. I, along with several other county board members, am proposing to increase our reserves by approximately $5 million. n End Result: I do believe that there will be some tax increase, especially because we need increase our reserve fund and improve our credit rating. How much is unclear. Ice Age Trail and Land Purchases: I voted to purchase 131 acres to expand our renowned Ice Age Trail. This greenspace is the only Dane County parkland designated a National Scenic Trail by Congress, and this purchase was a top conservation priority for the state and Dane County. That being said, I think it is time to decrease our land purchases—even if for just a short while—until we restore our credit rating and reserve fund. I support reducing our conservation funding in the 2011 budget. As always, please contact me with any thoughts or questions. Email is bayrd@co.dane.wi.us. Phone is 442-6294 home and 658-7333 cell. With a mixture of sweet sadness and hope for the future I announced recently my intention to step down as county executive. Over the past 14 years I’ve given this job my all and am deeply grateful for the opportunity you have given me. Together, we’ve done important and meaningful work on the problems people care about and made a difference for our friends, neighbors, and our future. I’ve been elected more times and served five years longer than any other Dane County Executive. My election as the first woman Dane County Executive was historic and I’m grateful that now any woman can believe she has the opportunity to serve. In my 14 years, the three principles I tried hard to follow were taught to me by my parents and grandparents: don’t waste land, don’t waste money and don’t waste kids. I’d like to think they’d be proud of my 14 year record on each. We’ve created unique programs to help moms and dads get jobs so the next generation has a healthy start and can move out of poverty. We’ve created national “firsts” for environmental protection and protected over 10,000 acres of land for future generations to enjoy forever. We’ve proven that progressive policies and fiscal restraint can go hand-in-hand. I’ve fulfilled the two promises I made when I was last re-elected in 2009: to build the first ever community manure digester in the nation to keep phosphorus out of our lakes and to launch real cultural change around the costs and suffering from our community’s abuse of alcohol – our coalition has already made a difference! I don’t know what the next chapter is for me, but changing the world is what I will continue to do! I will leave with profound gratitude for the honor of serving you and nearly one-half million Dane County citizens. Thank you all for all that you have done to help me serve you. Thanks for reading and for caring about our neighborhood.